TEMPLATE RELEASED, START COOKING RIGHT NOW!! I hope you're ready for an unforgettable eventeon. This event is dedicated to the creation of charts for a BMS rendition of "Steamed Hams But It's A Piano Dub", a parody video made by Finn M-K for the scene commonly referred to as "Steamed Hams" in The Simpsons. It looks like I have time for this... When is it happening? Great! How do I participate? As soon as the cooking period begins, the staff will provide a keysounded version of the video (where the piano is keysounded, and the audio from the video put in the BGM), and participants must use it as a template to create a chart. You can create and submit as many charts as you want (we recommend, however, that you create just one but with all your passion for steamed hams imbued in it). Once tasting period begins, the staff will compile every submission in an archived folder.and upload it for you to rejoice upon. You will then be able to taste each ham and leave comments on their respective pages to give your appreciation to the cooks. Which rules must my chart conform to? Your entry must not have the "Genre" and "Title" fields left blank. Coming up with something to fill these fields is part of the event. Nobody wants to eat a meal one cannot even describe with words. Do not remove what is initially in the #ARTIST and #SUBARTIST fields. 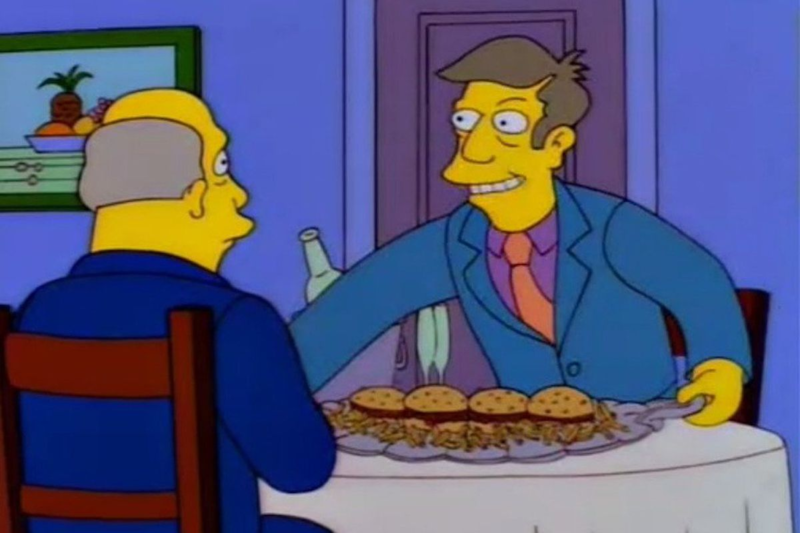 The title must contain as is, or a mutation of "Steamed Hams". What is considered a proper "mutation" shall be entrusted to the participants' judgment. Be reasonable in the name of good spirit, for too much steam might end up being perceived as smoke. You are allowed to bring in external files within your BMS, as long as said files respect the "BMS Format" section of the BMS Event Rule Standard. Here, "external content" strictly refers to images/movies (for BGI/BGAs), or even additional keysounds (the piano takes 733 keysounds, so you may add 500 more). The initial template's structure can also be modified by rearranging the notes or adding BPM changes. Your chart must not be a BMSON. Just use the template as a starting point, which is a regular BMS. Please. My chart is ready, what do I need to check before submitting it? For questions, please contact me on Twitter or on Discord (AYhaz#9264). I hope to see you, either in the kitchen or at the dining table.